The woman, who had to urgently attend to a critical patient, demanded that Alphons gives her in writing that her flight will never be delayed. IMPHAL: A Medical student from Bihar had a verbal spat with Union Minister KJ Alphons after her flight was delayed due to President Ram Nath Kovind’s visit to Manipur.The incident happened on Tuesday at Tulihal airport in Imphal. The President had visited the state to inaugurate the North East Development Summit and the Sangai Festival. The final-year student of gynaecology at the Regional Institute of Medical Sciences, identified as one Nirala Singh, was miffed that she was getting late for the funeral of a relative. Then Alphons came out of the airport, and the student instantly picked a quarrel with him, complaining about the delay. In a video that has gone viral, she is seen screaming at Alphons. The minister tried to calm her down, but she kept arguing with him. It was not known if she could eventually catch a flight. 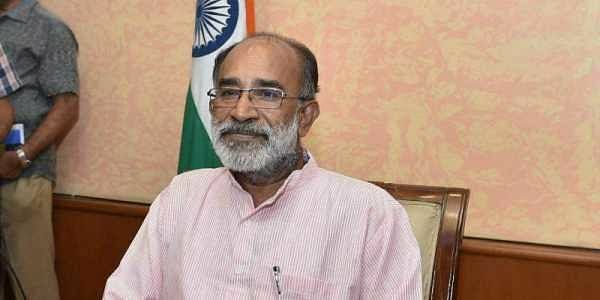 Asked about the incident, Alphons told The New Indian Express on Wednesday that passenger flights had been delayed due to the President’s visit. “I tried to convince her saying that the President’s flight was landing, and it was only security protocol that when the flight of the President or the Prime Minister is landing, passenger flights are not allowed to take off or land. It’s a tradition that has been there for 70 years,” he said. The President and the Prime Minister have to be given the highest level of security, he said. “She was upset as she was going to Patna to attend a funeral. I understand her agony. Media is reporting that other flights were delayed due to the landing of my flight. This is not true,” Alphons said. He and Union ministers Suresh Prabhu and Jayant Sinha had arrived in Manipur by the same flight. “I had to go to Patna at 2.45, which was the scheduled time,” the medical student is heard saying in the video. At this, an unidentified man is heard trying to say something to her, but she immediately cuts him short, saying “I know. I am a doctor. The body will degrade and it will smell”.